The members of Marquis of Lorne Chapter No 1354 were honored by the presence of Third Provincial Grand Principal Ian Highamas their principal guest. Ianwas accompanied on this occasion byAssistant to the Provincial Grand PrincipalsMike Threlfall,distinguished acting Provincial grand officers,Provincial Grand Scribe NehemiahDavid Case, Provincial Grand Assistant Director of Ceremonies Ian Boardman,Provincial Grand Standard Bearer Dennis Skett andProvincial Grand Steward John Selley,along with grand officers Eddie Barlow, Malcolm Parr, Len Hart and Chairman of Leigh Group Jonathan Heaton. Ian Higham congratulates James Carmichael-Prince. Upon opening the chapter, first principal Tony Roe welcomed the visitors and opened the conclave in a most excellent manner. 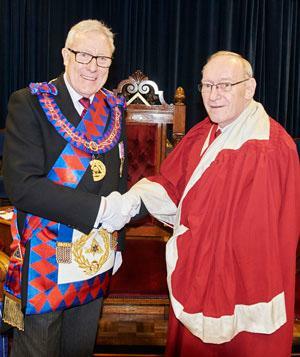 Ian was then warmly welcomed by the three principals to the chapter. The installation ceremony commenced with the companions of the chapter and visitors being treated to an excellent and faultless ceremony, where they saw Tonyproceed to perfectly install James Carmichael-Prince as first principal, David Ingham, who had work commitments, will be installed as second principal on some future occasion and Roy Grime affirmed his previous obligation to attain the chair of the third principal. The robe addresses were delivered with typical excellence by Cliff Jarvis and the sincere and solemn scripture readings were enjoyed with due reverence by all. At the conclusion of the ceremony, Ian brought greetings from the Grand Superintendent Tony Harrison, congratulating the newly installed principals, by saying: “The Grand Superintendent hopes you have a good and enjoyable year in office.” Ian then congratulated Tony for the excellent work he carried out during his tenure of office, coupled with his excellent deliverance of ritual during the evening. He further thanked all the members of the chapter for the enjoyable ceremony, commenting on how well the companions of the chapter had pulled together for the event. James, as the newly installed first principal, then presented a number of cheques on behalf of the chapter; £100 in favour of the MCF 2021 Festival, £50 to Leigh Masonic Hall Building Fund and £50 to the Leigh Group Masonic Charity. On behalf of the recipients, Ian thanked the companions for their generosity. At the conclusion of the ceremony, the companions retired into the Hilton Suite for the festive board. It was here that Ian, in response to the toast to the grand officers, congratulated the chapter on a well-organised ceremony, before thanking those grand and acting Provincial grand officers present for their continued support. He then moved on to discuss the MCF 2021 Festival, noting that it was great to see so many companions wearing their festival jewel, adding how pleasing it was to see the fantastic commitment being shown by the Marquis of Lorne Chapter to the Festival. Ian then touched upon the need to make sure that fellow brethren were made aware of the Royal Arch and that we need to go out, identify our fellow Masons who are not wearing Royal Arch Jewels in Lodge and sell it to them. Ian Higham (Centre) with acting Provincial grand and grand officers congratulate James.